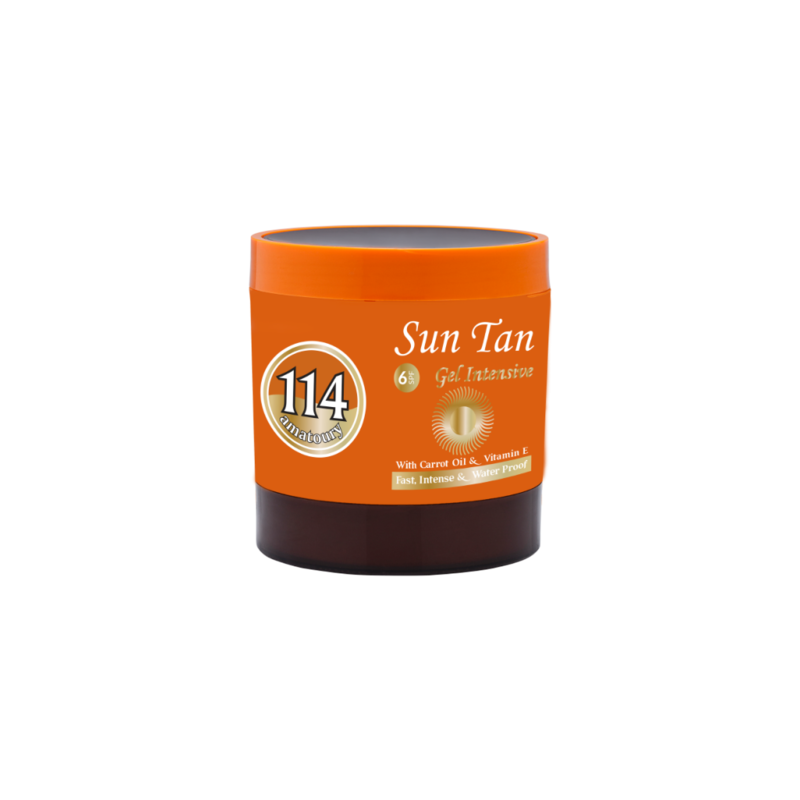 114 Sun Tan is a range of products specially formulated to provide skin with an immediate glow while allowing you to a obtain a deep and intense golden tan. Enriched with carrot & vegetable oils, it helps to protect the skin from dryness and flaking, leaving it smooth and supple. amounts of Carrot Oil and Vitamin E to stand out as one of the fastest waterproof products to deliver a deep even tan and a beautiful healthy glow to your summer skin. A variation from the classical Sun Tan Oil, our waterproof Sun Tan Gel from Amatoury is easily absorbed by the skin while leaving it moisturized as it captures an intense bronze color. 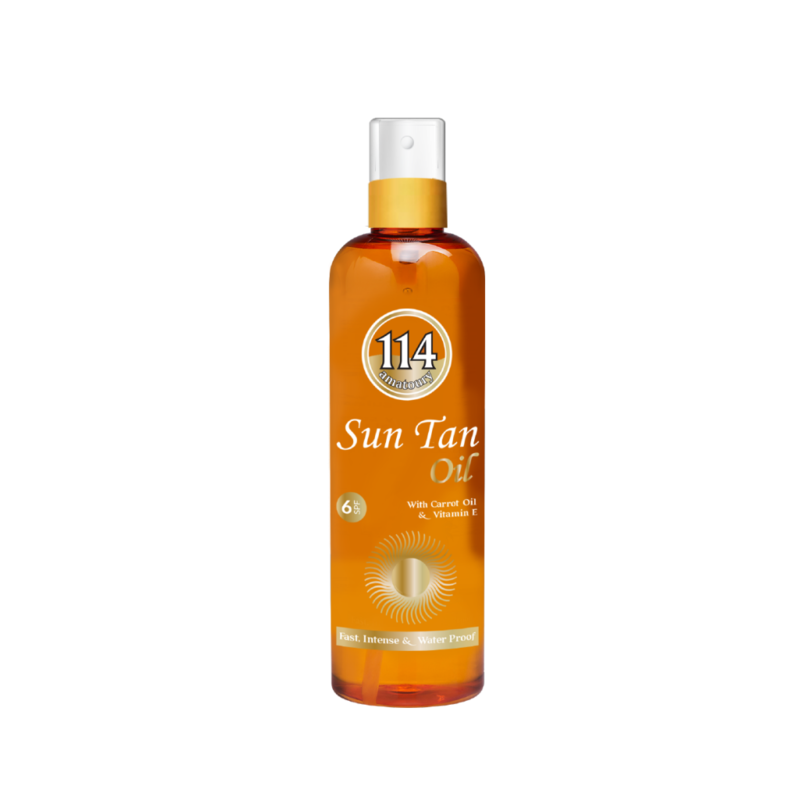 Vitamin E and Carrot Oil make sure your tan comes off bright and intense, as your skin stays healthy during the process. 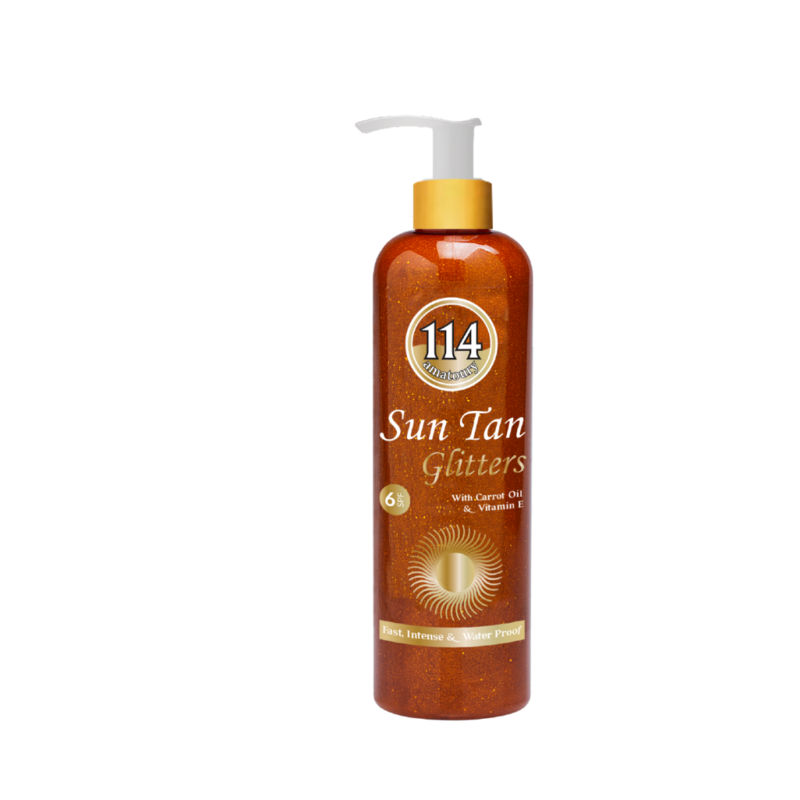 Yet another variation of the Sun Tan Gel by Amatoury 114, this waterproof glamorous version of the product leaves your skin shimmery and shiny as you tan. Vitamin E and Carrot Oil concentrates, make sure your tan comes off bright and intense, as your skin stays healthy during the process. Sometimes, you want your tan and you want it yesterday! This is why Amatoury’s Intensive version of the waterproof Sun Tan Gel is formulated to deliver a fast safe tan. Just as the rest of the tanning range from Amatoury 114, this tanning gel is infused with Vitamin E and Carrot Oil to moisturize the skin and deliver a beautiful even tan, in one sun session. Petrolatum, Mineral Oil, Beeswax, Prunus Amygdalus Dulcis (sweet Almond) oil, Daucus Carota ( Carrot Oil), PEG- 40 Hydrogenated Castor Oil, Perfume, CI 26100, CI 70725, CI47000. 114 SUNTAN BRONZE is a unique formula enriched with Carrot Oil and Vitamin E, designed to bring up a bronze tan with an instant glow and shiny look with minimal protection against the sun’s UVB. Viscosity of this product may vary with temperature because it is rich in wax. Mineral Oil, Beeswax, Ethylhexyl Methoxycinnamate, Silica, Tocopheryl Acetate (Vitamin E), Daucus Carota (Carrot Oil), Perfume, Mica, Iron Oxides, CI 77491, CI 77891, CI 19140:1. 114 SUNTAN GOLD is a golden formula enriched with Carrot Oil and Vitamin E, it provides minimal protection against the sun’s UVB rays and works to visibly smooth the appearance of skin leaving it with a beautiful golden glow. •tViscosity of this product may vary with temperature because it is rich in wax. Mineral Oil, Beeswax, Ethylhexyl Methoxycinnamate, Silica, Tocopheryl Acetate (Vitamin E), Daucus Carota (Carrot Oil), Perfume, Mica, Titanium dioxide, Iron oxides, CI 19140:1, CI 77891, CI 77491.